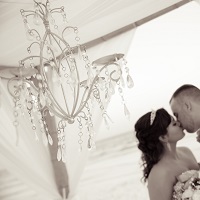 Add a Chandelier to your Arbor Rental. Choose your Color: Rot Iron, White, Silver. Size and Shape Vary based on selection. *This selection includes Chandelier only. Bamboo Arbor and additional décor pictured must be requested separately.